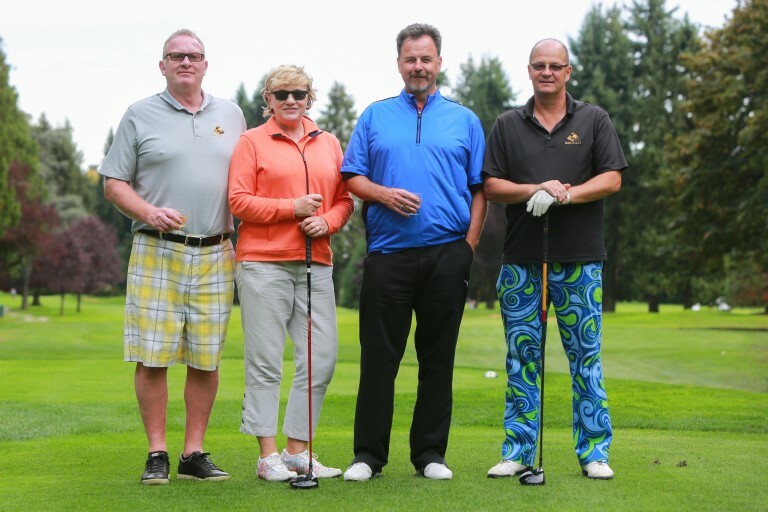 B2 Gold players at the 2014 B2 Gold Big Brothers Golf Classic. B2Gold Corp. is a Vancouver based gold producer with four operating mines (two in Nicaragua, one in the Philippines and one in Namibia) and a strong portfolio of development and exploration assets in Nicaragua, Mali, Burkina Faso and Colombia. B2Gold achieved another record year of production in 2014 producing 384,003 ounces of gold (or 391,162 ounces including 7,159 ounces of pre-commercial production from Otjikoto in December), and completed the year with a record fourth quarter producing 111,804 ounces of gold (or 118,963 ounces including 7,159 ounces of pre-commercial production from Otjikoto in December). In addition, on February 28, 2015, the new Otjikoto Mine achieved commercial production after a strong start-up following its first gold pour on December 11, 2014, one week ahead of schedule. In the fourth quarter of 2014, consolidated cash operating costs were $646 per ounce, comparable to both budget of $645 per ounce and $638 per ounce in the fourth quarter of 2013. All-in sustaining costs for the quarter were $946 per ounce (Q4 2013 – $986 per ounce). For the year ended December 31, 2014, consolidated cash operating costs were $680 per ounce (2013 – $681 per ounce) and all-in sustaining costs were $1,101 per ounce (2013 – $1,064 per ounce), both of which were within the Company’s full-year 2014 guidance range. B2Gold is projecting another record year for gold production in 2015. Company-wide production in 2015 from the newly constructed Otjikoto Mine, together with the Masbate, La Libertad and Limon Mines is expected to be in the range of 500,000 to 540,000 ounces of gold (including pre-commercial production from Otjikoto), an increase of approximately 35% over 2014 production. Consolidated cash operating costs are expected to be in the range of $630 to $660 per ounce. The substantial increase in the Company’s consolidated gold production and reduction in consolidated cash operating costs per ounce, reflect the positive impact of new production from the Company’s low-cost Otjikoto Mine. For the first half of 2015, gold production is expected to be in the range of 225,000 to 245,000 ounces which will be lower than the gold production in the second half of the year of 275,000 to 295,000 ounces, due to a number of factors including the continued ramp-up of gold production at Otjikoto. B2Gold’s corporate objective is to optimize production at existing mines and build further shareholder value through the exploration and development of existing projects and additional accretive acquisitions. B2Gold trades on the Toronto Stock Exchange under the symbol “BTO”, on the NYSE MKT under the symbol “BTG” and on the Namibian Stock Exchange under the symbol “B2G”. To learn more about B2Gold please click here.